Ubiquitin is an evolutionary conserved protein of 76 amino acids that is covalently conjugated to substrate proteins. Ubiquitin attachment is best known for its prominent role in targeting cytosolic proteins for proteasomal degradation. The C-terminus of ubiquitin is attached to e-amino-groups of lysine residues on substrate proteins, a process that involves a three-step enzymatic cascade consisting of an ubiquitin-activating enzyme (E1), a ubiquitin-conjugating enzyme (E2) and a ubiquitin ligase (E3) (Pickart 2001). The E3 ligase is responsible for substrate recognition and thus determines specificity. For targeting proteins to the proteosomal pathway, poly-ubiquitin chains need to be attached to the substrates, which are generally linked via internal lysine 48 (K48) residues on ubiquitin. However, many proteins are modified by the attachment of K63-linked ubiquitin chains, and usually this linkage does not support protein degradation. For NF-kB signaling, a number of different studies suggests that K63-linked ubiquitin chains provide the missing link between upstream signaling events and IKK activation (Chen 2005; Krappmann and Scheidereit 2005). Importantly, it was observed that TRAF proteins acting as intracellular adaptors for many physiological stimuli contain RING domains found in many E3 ligases. In cooperation with the E2 enzyme Ubc13/Uev1a, TRAF2 and TRAF6 preferentially catalyze the formation of K63-linked ubiquitin chains to target proteins (Deng et al. 2000; Shi and Kehrl 2003). TNFR1 trimerization induces oligomerization and trans-autoubiquitination of TRAF2, which further stimulates TRAF2 ubiquitin ligase activity (Wertz et al. 2004). Subsequently, TRAF2 induces the attachment of Relinked poly-ubiquitin chains to RIP1 (Fig. 3) (Ea et al. 2006; Li et al. 2006; Wu et al. 2006a). RIP1 ubiquitination greatly enhances the affinity of RIP1 and IKKy. This interaction is mediated by an ubiquitin-binding domain (UBD) on IKKy that selectively associates with K63-linked ubiquitin chains (Wu et al. 2006a). Thus, IKKy acts as a sensor for polyubiquitin chains after TNFa stimulation. Mutation of the potential ubiquitin acceptor lysine on RIP1 (K377) abolishes the ability of RIP1 to mediate IKK/NF-kB signaling after TNFa treatment (Ea et al. 2006; Li et al. 2006). How do K63-linked ubiquitin chains support IKK activation? 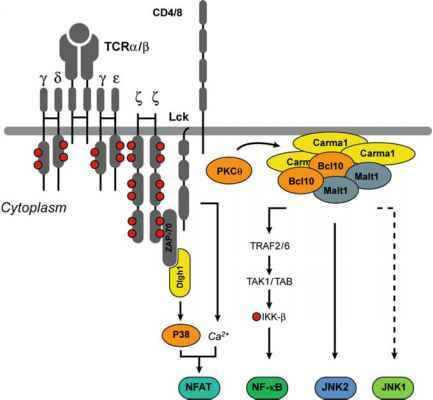 Several studies suggest a role for TAK1 as an IKK-activating kinase because of its ability to phosphorylate IKKP directly in the activation loop (Sato et al. 2005; Wang et al. 2001). Importantly, just like IKKy, the TAKl-binding (TAB) proteins TAB2 and TAB3 display high affinity to K63 ubiquitin chains on RIP1 (Kanayama et al. 2004; Wu et al. 2006a). Thus, RIP1 ubiquitination recruits TAB2/TAB3/TAK1 and the IKK complex to the TNFR1. IKKP is then phosphorylated by TAK1, which evokes IKK activation (Wang et al. 2001). Congruently, TAK1 gene silencing and deficiency impair TNFa-induced IKK/NF-kB signaling (Sato et al. 2005; Shim et al. 2005; Takaesu et al. 2003). Intriguingly, IKKy itself is also modified with K63-conjugated ubiquitin chains, suggesting IKKy is not only a sensor of ubiquitin chains, but is also a substrate, and this may contribute to the recruitment of known and unknown ubiquitin binding proteins (Kanayama et al. 2004). Studies on the regulation of TCR-induced NF-kB activation provide additional evidence for a prominent role of ubiquitination in the NF-kB pathway. The Bcl10-Malt1 signaling module was shown to induce IKKy ubiquitination (Fig. 3), suggesting that regulatory ubiquitination could promote IKK activation upon antigenic stimulation (Zhou et al. 2004). It was proposed that Malt1 contains an intrinsic E3 ligase activity. Alternatively, TRAF6 was shown to enhance IKKy ubiquitination, and TRAF6 interacts either directly or through Caspase8 with Malt1 (Bidere et al. 2006; Sun et al. 2004). Ubiquitin-binding TAK1/TAB complexes were suggested to serve as an IKK kinase upon T cell activation, and siRNA experiments support a function of TRAF2, TRAF6 and TAK1 in IKK activation in a human T-cell line (Sun et al. 2004). However, conditional genetic deletion of TAK1 in CD4 positive T cells results in defective NF-kB activation only in mature thymocytes, but not in effector T cells, indicating that TCR-mediated regulation of NF-kB differs among T-cell subpopulations (Wan et al. 2006). The identification of deubiquitinating enzymes that preferentially disassemble K63-conjugated ubiquitin chains supports the concept of a regulatory function of ubiquitination. Genetic ablation of the zinc-finger protein A20 results in sustained NF-kB activation after TNFa stimulation, which causes an inflammatory phenotype (Lee et al. 2000). A20 interferes with IKK/NF-kB signal transduction via two modes of action that both target RIP1 (Wertz et al. 2004). Primarily, an N-terminal deubiquitinase (DUB) activity of A20 removes K63 ubiquitin chains from RIP1. Secondly, an ubiquitin ligase activity in the C-terminus of A20 conjugates K48-linked ubiquitin chains to RIP1, which is subsequently degraded by the proteosome. The removal of regulatory ubiquitination as well as the attachment of degradative ubiquitin chains contributes to the downregulation of TNFa-induced IKK activity (Wertz et al. 2004). With CYLD (cylindromatosis) another DUB has been identified that balances NF-kB activation. Mutations in CYLD were initially found as a predisposition for the development of benign tumors of hair follicles and salivary glands in humans (Bignell et al. 2000). CYLD was identified in systematic screenings searching for DUBs that interfere with NF-kB activation (Brummelkamp et al. 2003; Kovalenko et al. 2003; Trompouki et al. 2003). Biochemical analysis suggested that CYLD specifically removes K63 ubiquitin chains from TRAF2, TRAF6 and IKKy. The generation of several CYLD-deficient mice led to conflicting results concerning the physiological relevance of its DUB activity in NF-kB signaling (Massoumi et al. 2006; Reiley et al. 2006; Zhang et al. 2006). However, recently published data on myeloid cells isolated from CYLD-deficient mice implicate that CYLD is involved in NF-kB de-activation after TNF stimulation in vivo (Zhang et al. 2006). Even though not all players have been identified and many questions regarding the exact mechanistic details remain to be resolved, the studies provide compelling evidence that K63 polyubiquitination serves as a platform for the tight association of protein kinases on the route to IKK/NF-kB activation. New classes of pharmacological inhibitors can be envisioned that either target ubiquitin ligases involved in the formation of K63-linked ubiquitin chains or disrupt the interaction of ubiquitin chains and the respective UBD. Especially for the latter, it will be very informative to resolve the structure of ubiquitin-UBD interfaces.